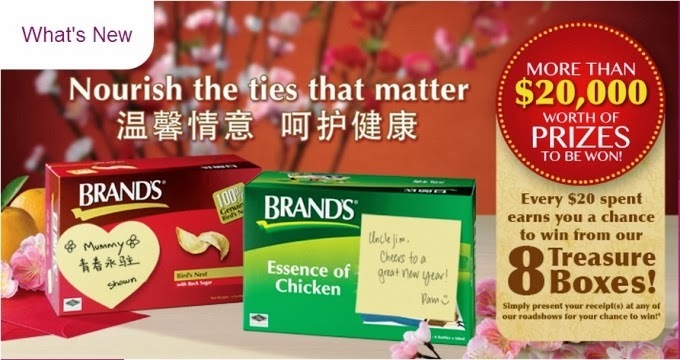 BRAND’S® CNY Gift Hamper Promo at Chevron House Roadshow! 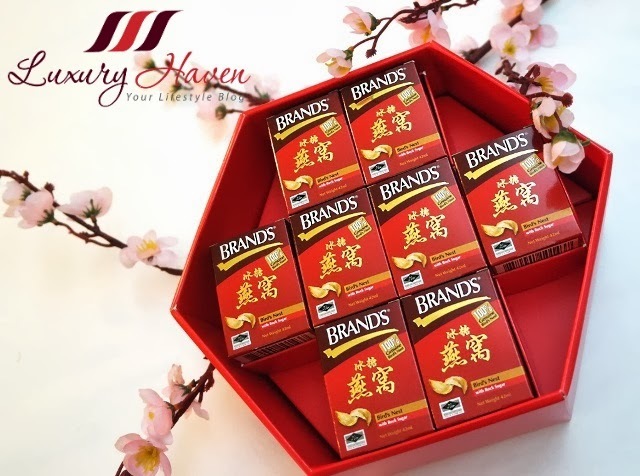 You are here:Home » Promotion / Events » BRAND’S® CNY Gift Hamper Promo at Chevron House Roadshow! 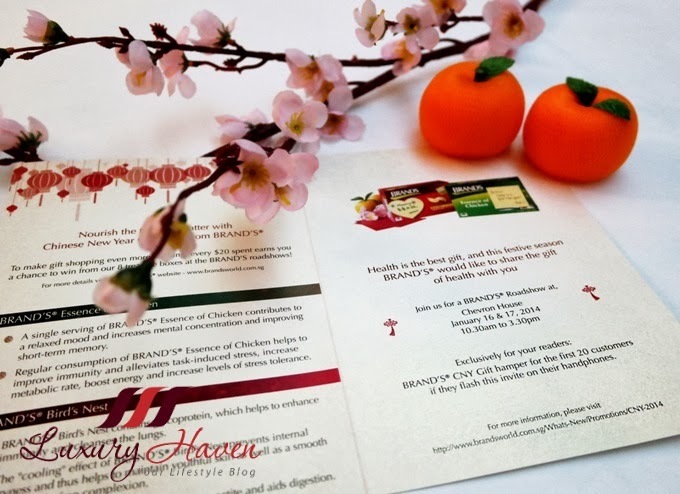 Make this Chinese New Year a meaningful one by giving the Gift of Health with BRAND’S® CNY Gift Packs! Do you know that a single serving of BRAND’S® Essence of Chicken contributes to a relaxed mood, and increases mental concentration and improves short-term memory? 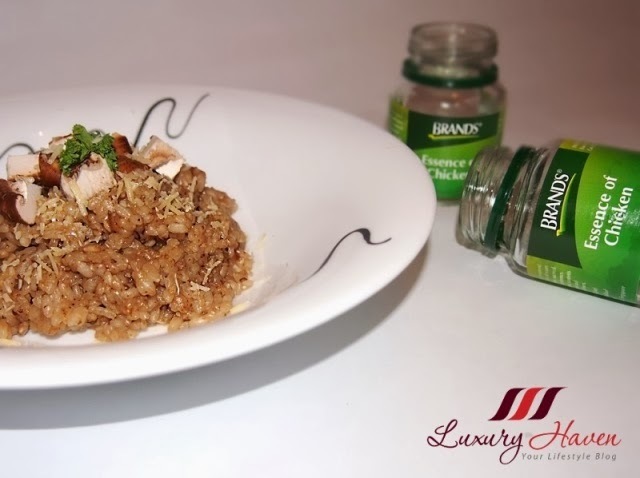 What's the best way to consume BRAND’S® Essence of Chicken? The Chicken Essence may be consumed straight from the bottle at room temperature, chilled or warmed accordingly to one’s preference. The nutritious drink can be taken daily at anytime, anywhere as part of a balanced diet. Are you aware that the "cooling" effect of BRAND’S® Bird's Nest prevents internal dryness and thus helps to maintain youthful skin as well as smooth and wrinkle-free complexion? Thanks to BRAND’S® Singapore, I've got to enjoy more of these health supplements! More than $20,000 worth of prizes to be won! Head down to BRAND’S® Road-show and stand to win cash and other attractive prizes! Every $20 spent on participating BRAND’S® products* earns you a chance to win from their 8 Treasure Boxes! Bonus: Exclusive to readers of Luxury Haven! 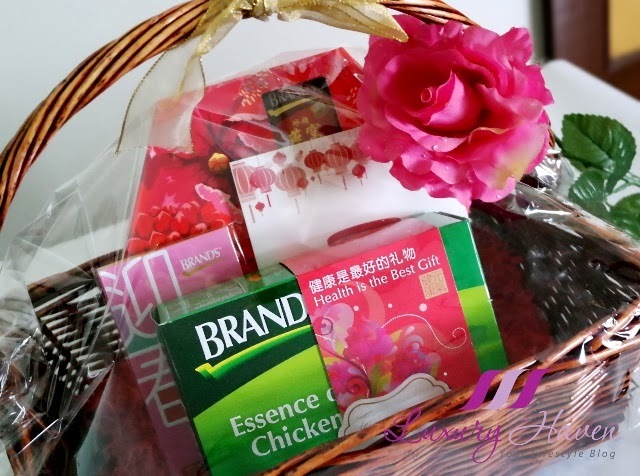 *Flash this invite on your handphone to receive BRAND’S® CNY Gift Hamper for the 1st 20 customers! 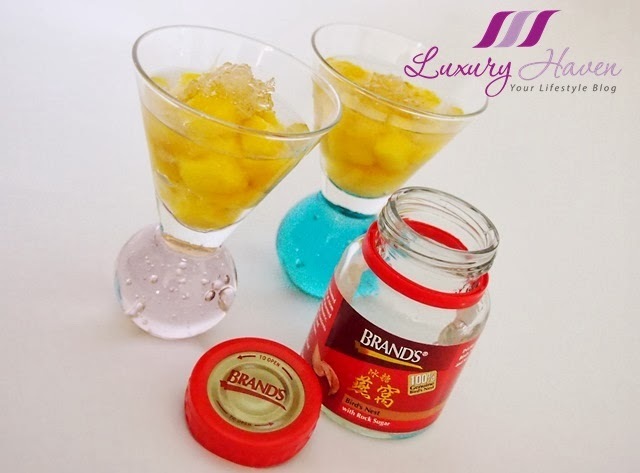 BRAND'S® Bird's Nest Fruity Affair! I am a number one supporter of brands. Its my remedy too when I'm tired and sick. In fact my mum is a bigger supporter of it. Nice dish you've created with the product. Nava, thanks for sharing the benefits of Brands with us! Toast to healthy lifestyle! Wish I can get it here, Your photos reminds me of celebration. Subha, I'm surprised you can't get it over in your hometown. Perhaps you'd like to keep a look-out the next time you go shopping? Oh yes, Brands have been a well known health products carrier and it never fails to deliver what it claim. In fact I have found their collagen jelly strips especially tasty. DS, I love their RubyCollagen Strips too! It's nice to have so many fans of BRAND's here~! Brands seems like a pretty good product. I love a good soup. LL, it has been around for the longest years! Yap, it makes a nice chicken soup! 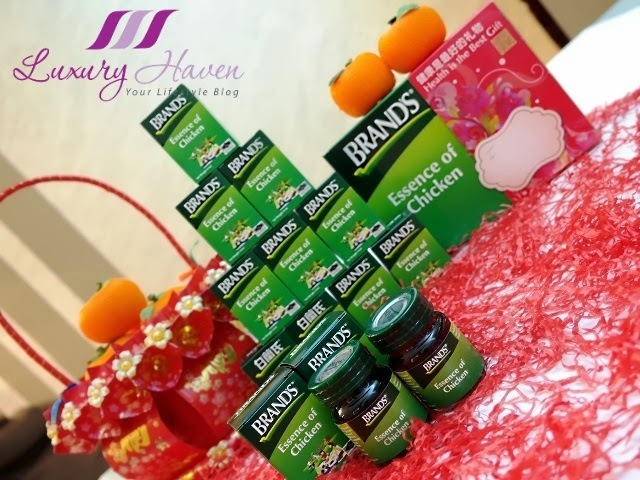 Love your bird's nest recipe with brands Shirley! Cquek, yap! These make great gifts too! Intrigued by the "bird's nest", hope you will post in detail about this unique Chinese delicacy. Wishes in advance, happy new year ! Rajiv, I've actually talked about Bird's Nest in one of my old posts together with a recipe at Golden Bird’s Nest in Hawaiian Papaya. Hope you'll like it too! I'm a fan of Brands chicken essence and bird's nest, but they're so expensive in Australia so I only have them occasionally. Lina, I love it! Hahaha! I dont mind taking the bird's nest. Now you are drinking this too and you will look younger & younger! Thank you so much for the lovely gift which i received on Monday. TM, thumbs up! Glad you've received the goodies. Keep your wonderful comments coming! Rose, me too! Keeps me youthful. Heehee! 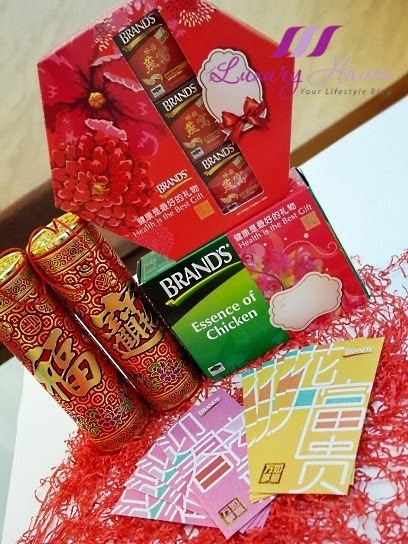 Nice gifts for the CNY...they all look great! Juliana, they taste great too! Glad that Brands are available in Melbourne but they are much more expensive here. I love soup and this sound great awesome post doll. Jackie, thanks dear! Have a great week! I always prepare brands essence for my family . It is really a good energy supplier. Is there still have free gifts exchange using bar code or lids? I keep so many. Thanks. Thanks for visiting Luxury Haven! Perhaps you could check with Brand's sales promoters on their current promos? Happy CNY!